The great American satirist Fran Liebowitz once told me that the trouble with the personal style of some people is that they got locked into the images they had of themselves in high school, and never moved beyond them. She said this was most evident in the way people wear their hair. You may have looked good with Farah Fawcett hair in 1976. But 36 years later, it’s a different story. Still, some of us insist on hanging on to illusions of ourselves, trying to recapture the ‘feel-good’ years of our youth by at least sticking to the same hairstyle we used to wear. Others, of course, radically change our ‘dos, whether dictated by harsh realities such as hair loss, change in hair texture, or change of hair colour. Of course, these days, there are so many options when it comes to the way we wear our hair, in terms of the wide array of cosmetic hair procedures that are possible, products we can use, or styles that we choose. In the mid ‘60s, living in the shadows of my mom’s bouffant and my sister’s beehive, I embraced the stick straight look, aspiring to look like Cher. My hair was pretty straight already, but I’d heard that Cher actually ironed hers, so I decided to try that too. But it wasn’t a hair appliance I used. Rather, I brought out my mom’s ironing board, spread my tresses on it, put a dish towel over them, and proceeded to flatten my hair with the same iron we used for my dad’s starched shirts. The technique was awkward, but it worked. 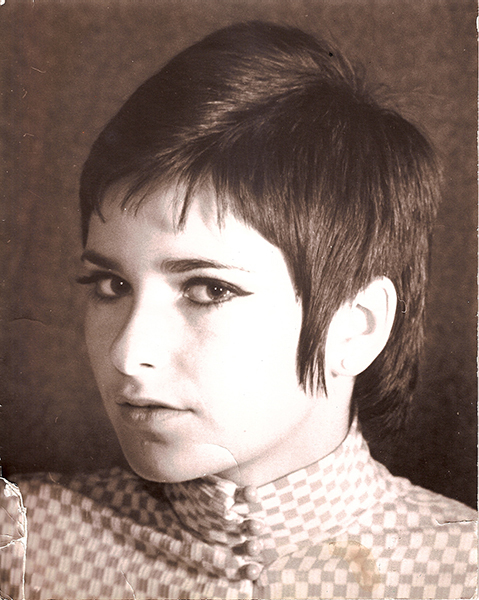 By the time I was 16, (circa 1968) and an aspiring young actress, I was so devastated when I didn’t think I got a part I’d auditioned for, that I went to Gus Caruso’s hair salon on Bloor St. and had my waist length hair completely lopped off in a kind of gamin pixie cut—something dramatic I’d seen my idol Mia Farrow do on the TV series Peyton Place. Much to my chagrin I got a call from the casting agent the next day to tell me that I had indeed won the role. I fretted as I sheepishly told her that I now had a very different look, with my new short ‘do, and maybe they wouldn’t want me after all. I breathed a sigh of relief when she said my hairstyle didn’t matter. Of course, by the next year, I tired of my little boy look, and as my hair grew out, I got a trendy new trim called the “surfer” cut—a kind of mop-top look, with straight across bangs, tapered at the sides, hair just about chin length. For a sexier option , I bought a “fall”. These were popular, must-have hairpieces that all my friends bought into in the late ‘60s. I even went wild and purchased a wig! But after wearing it to school for an entire day, I decided it was far too uncomfortable to put up with, despite the ultra glamourous statement it made. If you’ve got any fond reminiscences of the way you wore your hair in high school, I’d love to hear from you. And photographs would be much appreciated! Actually, a high school photo, and one of the way you look today, would be great fun to see. And if your hairstyle happens to be the same… well… just don’t tell Fran Liebowitz.